Passover kicks off with tremendous tourism; additional 18,000 people recorded at beaches along the Kinneret. Hundreds of thousands of Israelis flooded the country's national parks and beaches Sunday, in honor of the first day of Chol HaMoed Pesach (the Intermediate Days of Passover). 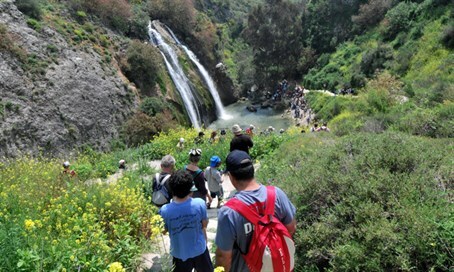 50,000 people were recorded to be at Ein Gedi National Park, Cesarea National Park, Einot Tzukim Nature Preserve, Eshkol National Park, and Gan HaShlosha (Sachne). An additional 18,000 people were reported to be at beaches along the Kinneret (Sea of Galilee) by 12:00 pm, with local authorities already forced to close several beaches that are past capacity, Channel 2 reports. Thousands more are hiking in forests nationwide, the Keren Kayemet LeYisrael (KKL) reports, and called on the public to pick up after themselves and observe fire safety rules during their travels. Traffic is stalled along major highways leading to Israel's best beaches and tourist sites as well. Route 77 is closed from Tziporit until the Golani overpass; Route 70, from Elikim intersection until HaTishbi overpass; Kvish HaHof from Poleg overpass to Yannai overpass; Route 1, from Sha'ar Hagai until Shoresh; Route 531, from Kfar Malal until downtown Ra'anana; Route 4, in the northbound lane from Pardesia junction to Ruppin; in the Negev, from Rahat until Lehavim and at the Shoket intersection.